Just in time for Fall, Skillet has introduced their new Pumpkin Sauce. You may know Skillet for their famous Bacon Jam, or their great food from their airstream trailer, or their new Skillet Diner. Now you can use their Pumpkin Sauce as a ketchup on a burger or your favorite food. 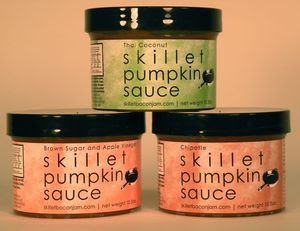 Skillet's Pumpkin Sauce comes in three unique flavors: Brown Sugar & Apple Vinegar, Thai Coconut, and Chipotle.